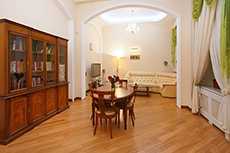 Dear friends, let me present you modern and extremely comfortable apartments located in historic center of Odessa. Main street of Odessa - Deribasovskaya, Opera and Ballet Theatre, the Potemkin Stairs – to get to all this places, takes you only a couple of minutes by foot. Our apartments - are spacious two-room suites with a kitchen , large refrigerator , mini bar, air conditioning , cable TV and , of course, the Internet (WI-FI). They combine stylish design, comfortable furniture and very reasonable prices! It’s a spacious, two-bedroom apartment decorated in a modern style - combining elegancy with incredible comfort. Pleasant colors, modern equipment and comfortable furniture will make your stay here unforgettable. This spacious, two-room apartment is decorated in a modern style – it’s bright, contrasting design will not leave you indifferent. Combination of black, white and red colors gives an incredible air of stylishness to this room. Let me present you beautifully decorated, two-bedroom apartment. It’s very spacious and designed in classic style - both luxurious and comfortable. The main feature of this room is elegant balcony - the longest solid balcony in Europe. 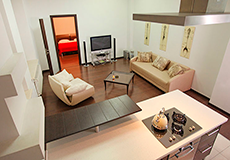 These apartmants are especially comfortable for a long stay. Modern furniture and classic design makes you feel pleasant and relaxed. Feel yourself like at home, enjoy our cosy apartments "Rose". These apartments consist of bedroom, kitchen, spacious bathroom and sauna, which makes you rest especially comfortable and unforgettable.